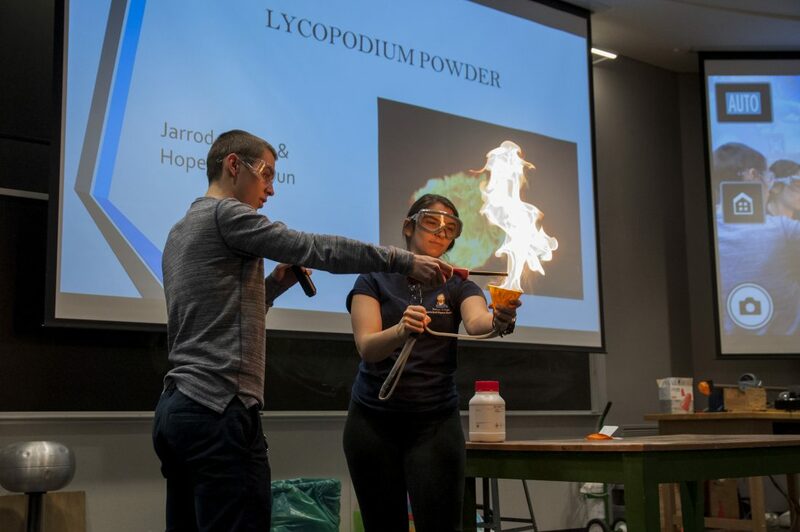 Courtesy photo Students from Juniata College participate in Physics Phun Night. HUNTINGDON — The Juniata College chapter of the Society of Physics Students has won an Outstanding Chapter Award from the SPS National Office. This is the 20th consecutive year the chapter has been recognized for its excellence as a top-tier student-led physical sciences organization, a designation given to fewer than 10 percent of all SPS chapters at colleges and universities in the United States and internationally. The Society of Physics Students is a professional association designed for students and membership is open to anyone interested in physics and related fields. SPS operates within the American Institute of Physics, an umbrella organization for professional physical science societies. The SPS chapter at Juniata College is advised by Jim Borgardt, Woolford Professor of Physics, and is led by student officers. The 2018-19 officers are: Camden Kasik, a senior from Silver Spring, Md., who serves as club president; Evan Ulrich, a junior from Homer, N.Y., who serves as vice president; Tristen White, a junior from Everett, who serves as secretary; and Hope Greenspun, a junior from Northfield, N.J., who serves as treasurer. “This esteemed award sheds light on the dedication and hard work that the members of the Juniata College physics department have towards education, outreach and inclusion within the community,” Ulrich. SPS chapters are evaluated on their level of interaction with the campus community, the professional physics community, the public and with SPS national programs. The Juniata College SPS chapter was recognized as outstanding for its efforts in activities both on campus and in the community, including outreach events such as Physics Phun Night and Mall Physics, and for its work in supporting inclusiveness in the sciences.